Students face more challenges than the loans that will dog them for years; some of them go hungry even as they go into hock to get that education. Low- to middle-income students struggle to buy books, gas to get to class, and nourishing food while working toward a better life. It is difficult to do mental work when hungry. The governor of New York, Andrew Cuomo, mandated this past summer that all New York public colleges will have a food pantry—“stigma-free food access”—by the end of 2018. “Hunger should never be a barrier for those seeking to achieve their dreams of a higher education,” Cuomo said. There are 64 schools in the State University of New York system and an additional 20 colleges in the City University of New York network. All these schools now either have a food pantry on campus or have partnered with a local food pantry for their students. Even some private colleges, such as Adelphi and Hofstra Universities and St. Joseph’s College, have them. 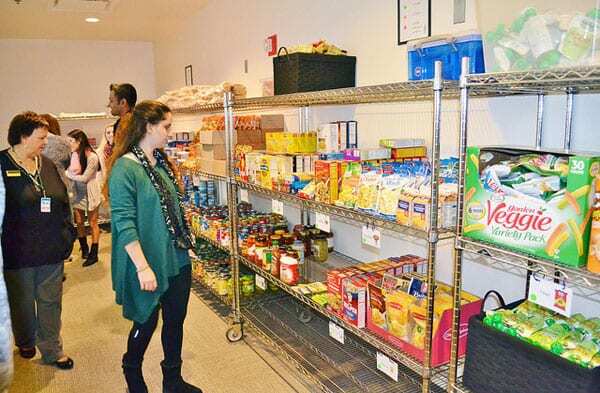 At Adelphi University, concerns about stigmatizing the students who use the pantry have led to the service being made available online. Students pick up their parcels at the mail room, where they are kept in regular shopping bags and identified with a unique barcode. Confirmation that the problem is systemic is in the findings of researchers at the University of Wisconsin-Madison’s HOPE Lab and the College & University Food Bank Alliance (CUFBA). Issued in September, the CUFBA survey results of 262 academic institutions who are members revealed that 217 operate food pantries. In the US, the HOPE Lab found that 36 percent of university students, along with 42 percent of community college students, experienced food insecurity in the 30 days prior to the survey, as reported this past April. Nassau Community College, the largest single campus community college in New York, has hosted a pantry called The NEST (Nassau Empowerment and Support for Tomorrow) since the 2015 fall semester. The NEST is a nonprofit founded by faculty, staff, and students, distributing over 2,000 pounds of food a week on a shoestring budget. An NCC student in radiation therapy and mother of two, Aliyah Black, 37, knows firsthand the difficult choices. She went back to school after working as an executive assistant and was left having to choose between buying food for her children or textbooks. School supplies and food available at The Nest make the struggle a bit easier. “I have extra money to make sure I have my bills paid, or I can put gas in my car, or I can pay my tuition, or I can pay for my books at school,” Black said. “Food tends to be one of the more flexible things in a person’s budget,” she said. If a student isn’t able to pay attention in class because they are hungry, they may not make it to graduation, leaving school without a degree and in debt. Awareness of the issue is growing nationwide, and the responses have become more prevalent, Cady said. When this D.C.-based food bank expanded its mission and took a stand, they raised both their funding levels and community health standards.